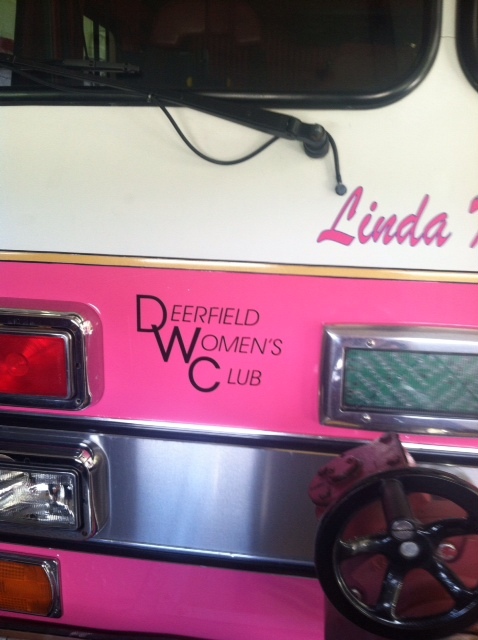 News Release – Deerfield T0wnship Fire Rescue and Deerfield Women’s Club launched “Pink Truck Project” at the first annual Touch-A-Truck event held at the Deerfield Towne Center. The special dedication took place at 12:30 pm on Saturday, September 15, 2012. Three years ago, Deerfield Professional Firefighters Local 4286 began wearing pink t-shirts during the month of October in support of breast cancer awareness. Saturday, a pink fire truck joined the cause and fundraising efforts. A unique partnership was formed with Local 4286 and the Deerfield Women’s Club, along with sponsorships by UC Health, Firehouse Decals and Tri-Health Event Medicine. These relationships enabled the funds for Deerfield Township Fire Resue to turn a red truck pinik. The truck was dedicated to the mother of a DTFR firefighter. The Pink Truck Project – “Raising Awareness, Building Hope, Driving For A Cure” will be the focus of fundraising activities throughout Deerfield Township and the Tri-State area during the month of October. “We wanted to do the right thing for our community and their families” stated Chief Chris Eisele. Visitors will be encouraged to sign on the pink decal and leave messages of hope and encouragement to those who have been touched by this consuming disease. For more information on donating and event locations, please contact Lt. Patrick Strausbaugh, Deerfield Township Fire Rescue at 513-459-0875.